When I first saw the hit musical movie Mamma Mia! in 2008, I couldn't believe how beautiful the Greek island setting looked like in the film. But when I finally visited the island of Skopelos in June 2018, I joined the Mamma Mia! Film Locations Tour and saw it with my own eyes. The feel‐good musical movie Mamma Mia! was filmed on two neighbouring islands in the the northwest Aegean Sea (Skiathos and Skopelos) as well as mainland Greece. Most of the film locations, however, can be found on Skopelos. The Mamma Mia! 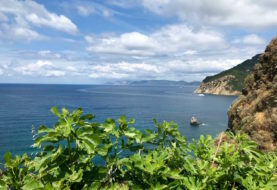 Film Locations Tour is a bus tour, which conveniently picks you up in Skopelos Town, the main town and port of the island, and then takes you to all major film locations around Skopelos. While on the bus, you will listen to the film's famous ABBA soundtrack. Additionally, an English‐speaking guide will provide some live commentary. The guide on my tour was a girl named Cherry. 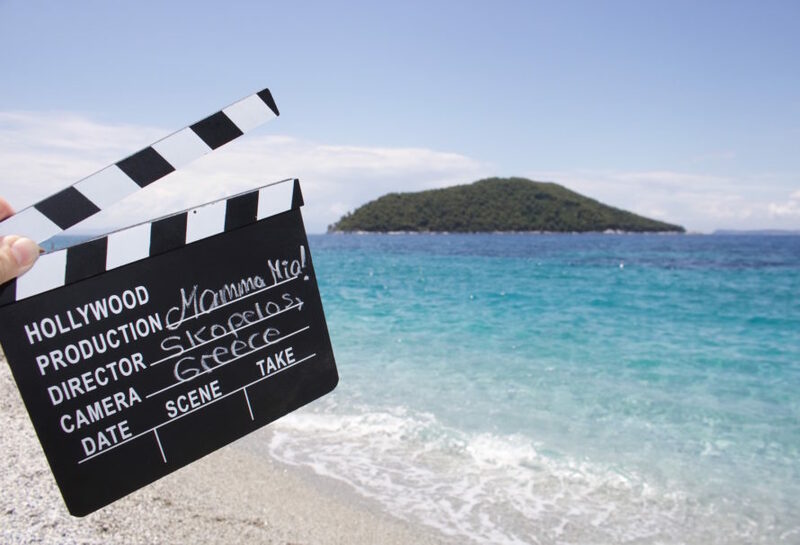 Because Cherry had participated in the film as an extra, she not only provided us with insightful information about the island and filming locations, but also shared some really funny stories about the Mamma Mia! cast and crew. Our first Mamma Mia! film location was the chapel on the rock, which is officially known as the Agios Ioannis Chapel. In the film, Donna's daughter Sophie (Amanda Seyfried) gets married here (or plans to get married here anyways). The chapel that you will see now looks quite different to that in the film. This is because the crew built a mock‐up chapel around the actual one for the duration of filming only. In this picture, I'm standing on the small hill in front of the chapel, which was used for filming the scene in which Meryl Streep (as Donna) and Pierce Brosnan (as Sam) perform the ABBA hit "The Winner Takes It All". Next, we were given the choice of climbing the 199 steps to the top of the rock or staying on the ground. Those who went up, were rewarded with some great views over the crystal clear sea. Our next stop had nothing to do with the film. But as virgin olive oil is one of the most important products made on the island, it was still good to briefly visit an olive oil press and (quite literally) get a flavour for local life on the island. We watched a short introduction film about how olive oil is made here and got a yummy taster of olive oil on bread. Our next stop was the very traditional village of Glossa. The village is located on a 250 metres high hill and thus offers stunning sea views all around. You will also find some of the typical Greek cobbled streets paired with colorful flowers here. A perfect photo spot! It had been raining quite heavily in the morning. Luckily though, by the time we reached the Mamma Mia! dream beach, the weather had cleared up so much that the beach didn't look any different from one you would find in the Caribbean. The scene, in which lovebirds Amanda Seyfried and Dominic Cooper (as Sophie and Sky) sing "Lay All Your Love On Me" was filmed in the right hand corner of the beach where you see the rock with the trees on it. The other side of Kastani Beach was the setting for Christine Baranski's (Tanya's) toyboy performance of the ABBA song "Does Your Mother Know?". On the way to our final stop we passed by the filming location for the small stone island, where Sophie and her three possible dads take a picnic and go swimming in the crystal clear waters. Then we arrived at the quiet bay and fishing port of Agnontas Beach. Most of us used our free time here to have some lunch at the local taverna. I was super happy that I didn't have to drive myself and that we were taken everywhere by an experienced bus driver. We were going up hill quite a lot and the roads seemed very narrow. What I also didn't realize beforehand was how big the island is. Thus, the tour was not only great to see some of the famous Mamma Mia! film locations, but also to see more of the island itself. After all, most visitors (including me) stay in or around Skopelos Town, which is nice, but nowhere near all that this gorgeous island has to offer. When? During the season (roughly from May to September) the Mamma Mia! Highlights Tour is offered every Monday, Wednesday and Sunday. At what time? The bus departs at 9 am from Skopelos Town and will be back around 3 pm. How much does it cost? The tour costs 30 Euros per person. How do I book? You can book the tour online via the Dolphin of Skopelos website or in person at the Dolphin of Skopelos office, which is located directly opposite the ferry port in Skopelos Town. Film Tip 2: Exactly 10 years after the release of the first Mamma Mia! 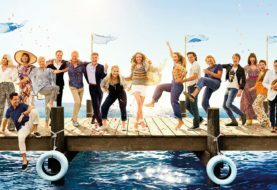 movie, the long‐awaited sequel Mamma Mia! Here We Go Again! will be released in cinemas worldwide on 19th of July 2018. This time all filming was done in Croatia, more specifically the Croatian island of Vis, even though the setting still is the same (fictitious) Greek island. Travel Tip: For more about visiting the Mamma Mia! islands of Skopelos and Skiathos and Greece in general, check out my other travel posts about Greece. Disclosure: In order to write about the tour, I received a complimentary ticket for the Mamma Mia! Film Locations Tour by Dolphin of Skopelos. As always, the views expressed in this blog post are entirely my own and reflect my honest, personal opinion about my experience.